【Size】: 11.2\" x 8.27\" (285mm x 210mm) 20 month Undated desk or wall calendar pad with light blue birds hibiscus pattern. Each page is perforated to tear away easily. 【PREMIUM PAPER QUALITY】: Quality post-consumer waste recycled think paper will effectively prevent ink bleed and dilapidation when carrying. 【All in one Calendar Pad】: Checking memo and to-do list sections integrated into the calendar with special format. Neatly format make you organize your life effectively. 【Undated Design】: allows you to arrange your life, work and study freely. You don\'t have to worry about wasting when you want to take a break on organizing. 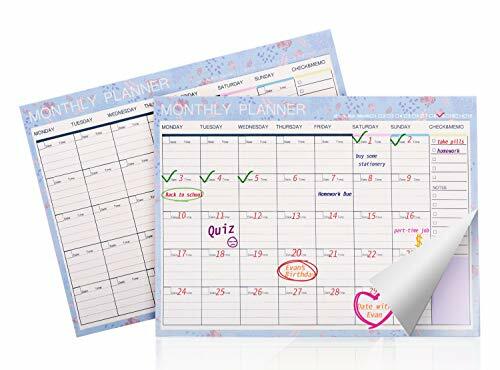 【Other Features】: 20-month decorative desk blotter calendar. it\'s the perfect way to dress up your desk. The perfect A4 size is fully portable and lightweight enough to carry anywhere or fold and put into books, planners and binders.